I had a truly tough week the week before last – one of those weeks where every day was a struggle. After nights of tossing and turning in bed, I woke each morning, dreading the day ahead feeling little motivation or excitement for what I’d planned. Each afternoon, as the final bell rang, I’d sigh with relief and head home as quickly as possible to collapse on my bed. Why? All due to a horrible combination of back pain and sleep deprivation! Incredibly debilitating. The final straw for me was when the last class of that week (year 6/7’s) arrived into my room pleading not to ‘do any more stories’. That statement gutted me. However, I deftly avoided any discussion about it because I wasn’t in the right place to deal with it rationally and instead asked them what they would prefer to do, insisting that all suggestions had to be language orientated. It came down to a vote between grudge ball and Bop! & grudge ball won. I couldn’t find their story, so instead used another class’ story (same target structures based on the same movie talk) asking for translations of random sentences into correct English. It was still worthwhile and enjoyable, although in hindsight I should have also randomly awarded points to various groups for behaviours such as having a go, working as a team, staying positive etc. because as soon as one group appeared to be too far in the lead, several students found it difficult to remain positive! Since that lesson, I have been self-evaluating to try to understand why stories have become boring &/or unappealing. Now that the pain and lack of sleep fog have reduced (thanks to my wonderful physio and remedial masseuse – you both rock) there are several issues that I have to address in order to get myself and my students back on the fun and enjoyable TPRS train. While this is the start of their 3rd year of TPRS, older students have just as much need for up/down based lessons as do the younger students. Expecting them to sit for the majority of their lesson (movie talks, story asking) has been unrealistic. I honestly believed that student performances would be sufficiently compelling and engaging to counter balance this but it just isn’t the case. My students would benefit from and appreciate a variety of frequent activities incorporating movement and unpredictability that provide more repetitions of the target structures. 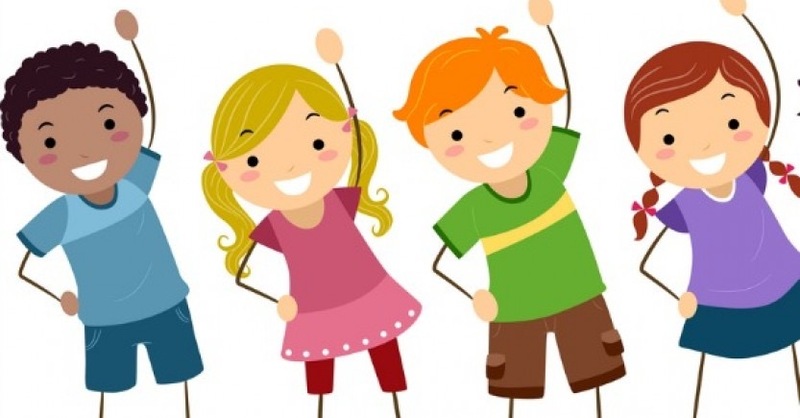 Whereas brain breaks provide learners with time out from heavy duty concentration, active tasks provide students with kinesthetic ways in which to consolidate language acquisition. These tasks need to become an integral part of my lessons. My aim now is to search for suitable activities that would serve this purpose and if you look back on the home page, you’ll see that I’ve added a new page titled ‘Target Structure CI Activities’ and as I find them, I’ll add new ones to the collection (any help building up this collection will be greatly appreciated). My classroom management system has relied up till now on students and has been in place with minimal changes for 2 years. I offer a variety of jobs that students can try out for and these include sekretaris, polisi, mendistribusi kertas, pensil dan clipboard, menghitung waktu, tukang foto, menghitung kata just to name a few. The polisi is tasked with monitoring the blurting yet this is not happening consistently across all classes. I need to incorporate a few more classroom management ideas to ramp it up. I really like Annabelle Allen’s idea of having a competition between teacher & class. I am definitely going to trial it next week. However, do I offer a reward if the students win? If so, what could it be? Or do I save this for later in the term/year in case once again, I need to ramp things up again to increase student engagement? Another idea I have used in the past (I’m sorry that I can’t remember where I read this and thus can’t credit them) is to have an object (soft toy/prop) that is passed around the class to the person who blurted last. The idea being that whoever is holding it when the lesson finishes has a consequence. When I first used this idea, I struggled with the consequence but not anymore. I am going to bite the bullet, be tough and insist on output from that student! If that student has so much to say, then they can do a 5/10 minute free write or even better, record their voice reading/retelling the class story in their own time. Hopefully this will give me a sneaky insight into their level of acquisition in a way that also gives me the opportunity to speak to them about their behaviour and how it impacts on other students. I also must incorporate more brain breaks into my lessons for a variety reasons. Not only will this increase student activity but also give students a chance to relax, take a break and have fun. All students appreciate fun, regardless of their age! There is no good reason why brain breaks are an important component of my junior primary lessons and yet not for my older students. Up till now, I have tended to include a list of brain break ideas at the bottom of each lesson plan just in case students need one. The main reason (I think) that I have avoided incorporating more brain breaks into my older students lessons is that I worry about ‘wasting’ their precious lesson time. Some classes only get one 50 minute lesson per week and therefore each minute is precious. I need to turn that thinking around and acknowledge the value of frequent & short brain breaks and be prepared to relinquish class time in order for students to learn the skills necessary for seamlessly moving into and out of brain breaks. Surely the benefits in the long run outweigh the negatives. Maybe I could tie it in with Annabelle Allen’s classroom behaviour management technique? Adding tally points to me if they are too slow or for the students if they regroup quickly and quietly afterwards. I now understand her comment that brain breaks should be done before they are needed and if you wait till students need the break, you waited too long. As usual during week one, the specialist teachers at my school all combined and addressed this as one team to students via games and activities in the gym. In week 2, I jumped straight into a movie talk, which I continued over the next few weeks, in between various absences due to my back. It was a hodgepodge start to the year. 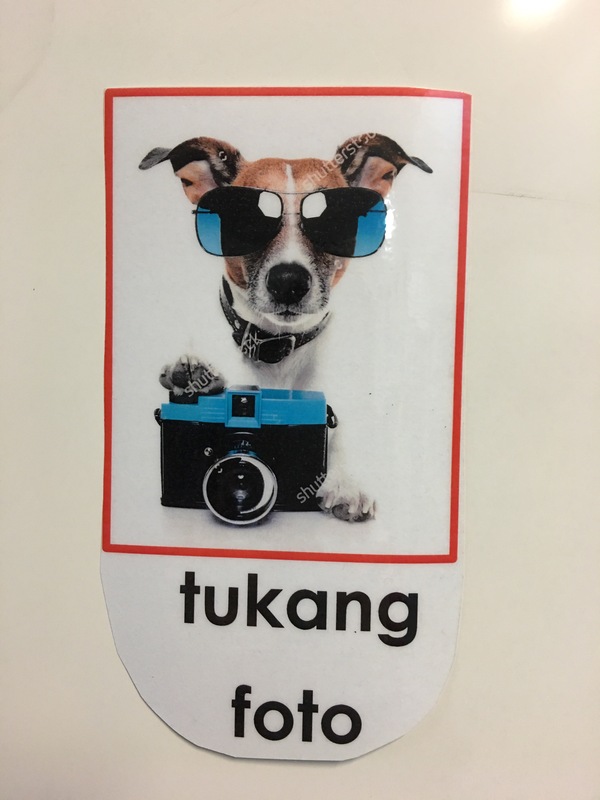 Some classes didn’t have an Indonesian lesson until week 4! While we are always wiser in hindsight, I realise now that this was a shabby start to the new school year especially considering I attended a TPRS conference during the holidays! I should have known better. One should never assume anything and as a consequence, I will need to go right back to basics starting next week. 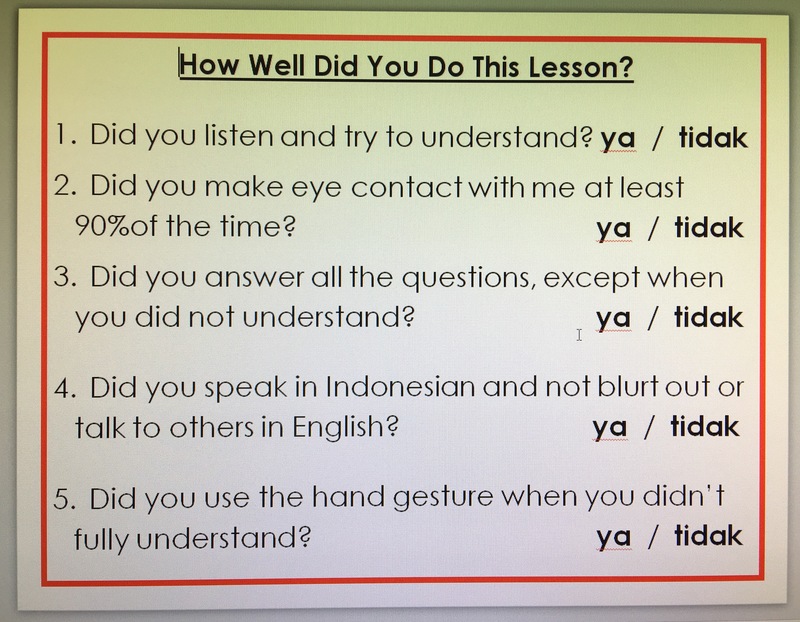 I plan to do that by reminding them of how they can become successful language learners and then regularly asking them to show me a quick honest self-assessment using their fingers (out of 5) to show how many of the questions below were ya. This will also include the reminder to job holders of their responsibilities and the possible consequences should they be failing this. I’ve just finished a webinar with Terry Waltz which for me mid-way through writing this post, was very timely! I did feel guilty at first for taking one of the very limited spots, but now I am very grateful that I did. One point she raised which fits perfectly into this post is about students feeling successful with their language acquisition. Terry suggested this could be done through exit quizzes, quick quizzes etc where the students always do well because for TPRS, its all about setting our students up for success. There is never a focus on incorrect answers, incorrect pronunciation, incorrect word order etc. It’s all about positive reinforcement and student high fives and it’s the major reason I heart TPRS. Students are never asked to revisit mistakes, never made to feel ‘dumb’ unlike in other subject areas where students are asked to walk through back their mistakes to understand where they went wrong! This is reflected in our class ‘bell curves’ when plotting data, because they are never ‘normal’. TPRS bell curves are heavily weighted towards the higher end of available grades/percentages unlike other subjects where it is more central. While spending quite a few hours trawling through fantastic TPRS blogs this morning (including those by Martina Bex & Keith Toda) looking for novel activities to get reps on target structures, it suddenly dawned on me that it wasn’t the story itself that the students were objecting to! It was all of the above issues that together created endless & predictable lessons with minimal spontaneity. Martina mentioned in one of her posts that all CI activities should not last more than 10 minutes, Terry Waltz also mentioned it yesterday in her webinar – I’ve heard and read this many times yet why do I feel compelled to keep going even when all the signs are telling me to STOP? It’s for a multitude of reasons yet the best thing of all is that I’ve finally realised what I believe was the unspoken message underlying my students plea. I can now begin to address improving my effectiveness as an Indonesian teacher through incorporating more variety and movement into my lessons and thus re-engage my students. NB: New goal – Overhaul lesson plans to incorporate all of the above points.